Apartment 528: New art for the living room! New art for the living room! We've lived in our apartment for over a year and NEVER found the right art to go on the wall behind our couch. Part of the problem is the wall color. We were originally going for a coral but we tried so hard to avoid being too orangy that we ended up way too pink! I've hated the color ever since but we've been too busy/lazy/tired to actually find a color we like or find any art that matched without making the room darker. We also needed the art to have some white in it to better tie in the bright white trim of the room and help bring down the contrast between the trim and the walls. And the art needed to be awesome! We considered making something ourselves and literally spent months trying to decide on a design only to come up with nothing. We considered maps and art collages and posters but nothing worked! 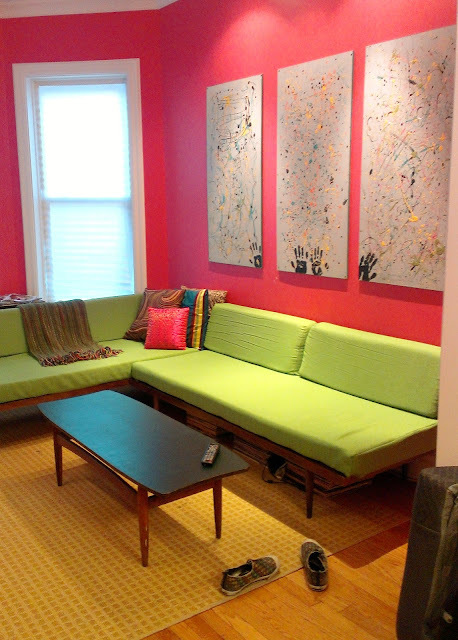 So we threw up some old splatter paintings we did in our old apartment and called it a day. Our old splatter paintings, which I can't stand. Just look at them. 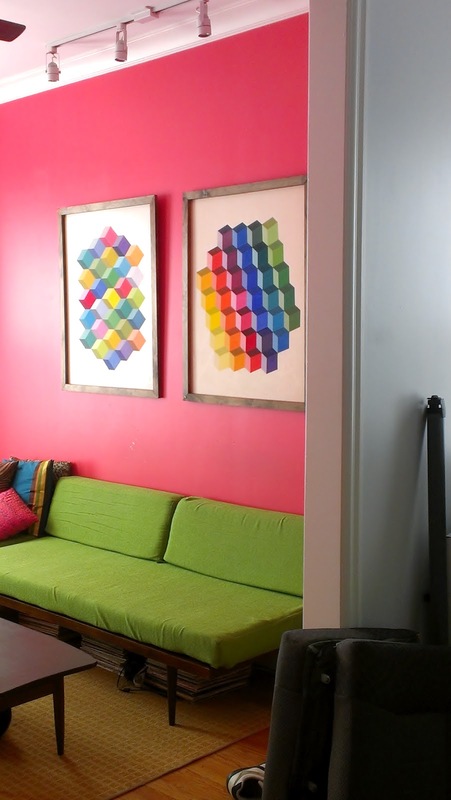 They're super colorful, and the background ties in our white trim. YEA!! John found the art, which is mounted on foam board, at an estate sale in Oak Park. It was created by the owner of the house; John couldn't remember her name. There were a few light stains and the edges were a bit roughed up, but it matched the age of the art and added character so it didn't bother me! 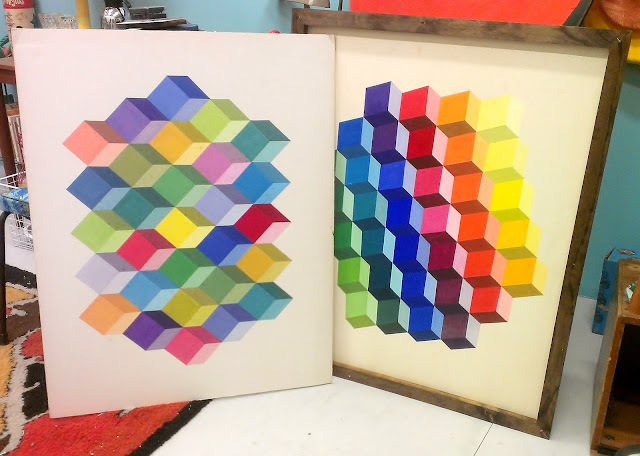 The only thing these babies needed were frames, which I was happy to make. 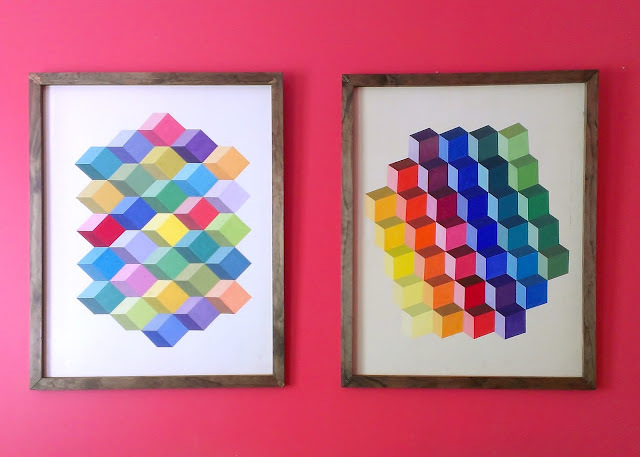 If you're ever in the need of a quick, easy-to-make frame, don't worry, you CAN do it! 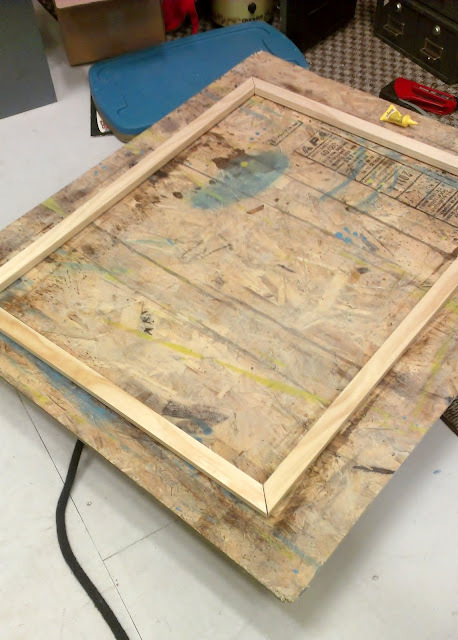 1) CUT: To make the frames, I used 1"x2" wood cut to the size I wanted. If you don't have a big miter saw to angle the edges, you can buy a small miter box (like one of these from Home Depot) that comes with a hand saw. We have one at home. It's easy to use and small enough for apartment dwellers. 2) JOIN: To keep the frame together, put wood glue or another strong adhesive (I used Loctite Power Grab) between the joints. After that, staple the joints together which serves to both hold them together while they dry and also reinforce the frame. Sometimes when you flip the frame over to the front you'll notice a small gap. You can fill them in with wood filler or a sawdust/wood glue mix. Let dry. 4) ATTACH: Lastly, staple the foam board/wood/art to the back of the frame. 5) HANG: I used screws and picture wire to hang the art but you can also use sawtooth hangers or even pop can tabs to hang it. Those are awesome! Looks great. Frames are really nice also. I adore the new art pieces! A fun op art feel with lots of colors. Also we need to swap some services soon... I can help you with any photography needs and you can build me some frames and re-recover my dining room chair seats! The frames are adorable! A must have! I really love all those colors that are used. Really love all that art.